Left to right General (Ret) David H. Petraeus, CEO of the Navy SEAL Foundation Robin King, Rear Admiral (Ret) Garry Bonelli. Photos Navy SEAL Foundation. I was born and raised in a suburb of Dallas where being in the military was not very common. My parents ran an advertising agency, so I grew up with creative influences in photography and art. I met my husband in high school, and through exposure to my dad and his circle of influence, my husband soon realized you could make a living shooting pictures. He pursued his goal of being a professional editorial and advertising photographer, and he enrolled in school in Los Angeles. I transferred to a college in L.A. as well, and soon graduated from California State University Long Beach with a degree in finance. Little did I know at the time, but my supercool magazine photographer husband had a hidden dream—to become a Navy SEAL. After a couple of years working in the photo biz, he told me what he wanted to do. I knew nothing about military life and was scared about the quality of life and the ability to earn a decent income. But it was clear that this was his passion, and seeing that I didn’t have a passion for my job, we decided to go for it. After taking time off work to start a family, I decided to go back to work for a fraternal order of Navy SEALs. The organization’s purpose was mainly social, but it also provided scholarships for the children of its members. 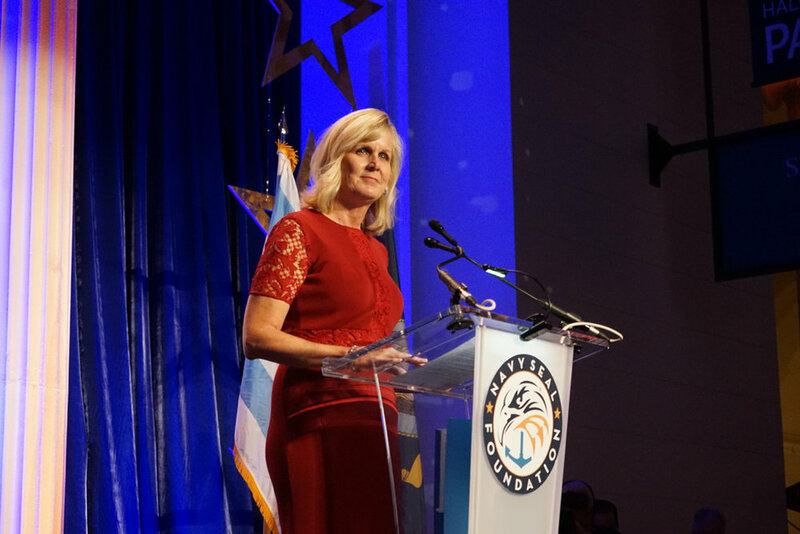 Through this job, I learned a great deal about the Special Warfare community and needs of the families, and I was lucky to be part of a group that helped launch what is now known as the Navy SEAL Foundation. After 9/11 and the loss of our first SEALs in Afghanistan, we realized how the world had changed—especially for the men, women, and families of Naval Special Warfare—and the Foundation began to grow and adapt to meet the needs. The Foundation started in 2000, and for the first few years, we focused mainly on dependent education. My role was on the finance and programs side. We were a two-person part-time organization. I worked with donors and program administration, and we simply tried to raise enough money to meet the evolving needs of the community. Through the strength and commitment of the board of directors—mainly former Navy SEALs—we leveraged our relationships and the great work we started doing for our Gold Star families, and we grew. In 2011, we merged with another foundation out of New York that had been raising funds for us, and we became the Navy SEAL Foundation. I remained on the finance side and worked overseeing programs, soon becoming Director of Finance and CFO. In 2013, our Executive Director left, and the board approached me about the position. Initially, I told them I wasn’t interested. I felt the position should be held by a former SEAL, and that we would be better able to raise funds with a SEAL in the lead role.The question “Why is a woman leading the Navy SEAL Foundation?” was bound to come up. After much deliberation and discussing it with my husband and my father, I realized not accepting this job was out of the question. I took the position in May 2013, and the Foundation has grown and evolved into a world-class national nonprofit, and I could not be more proud to be the CEO. What are the best things that the Navy SEAL Foundation does, in your opinion? The Navy SEAL Foundation adapts. It’s an agile organization that can be a quick reaction force, and it also provides sustainable, established programs. We have learned to listen to the faintest signals from the SEAL community about needs and stressors. We challenge ourselves to get in front of the issues and establish programs working with and through the active-duty service members, veterans, and their families. What does the Foundation do to help the families of SEALs, whether veteran, active, or fallen? Do you think this work is beneficial to them as well as to the community at large? The strength and resiliency of service members is deeply rooted in the strength and stability of the family. The Navy SEAL Foundation approaches the needs of the community through a whole warrior model. We focus on ensuring the SEAL knows his family is safe and secure at home so he can focus on the missions in front of him. Our family support programs range from educational support to community-building programs to taking care of the family if there is a dependent illness, injury, or death. We know the family is part of healing, so if a SEAL or veteran needs medical care, we ensure the family can be there to provide support as well. We take away those immediate stressors in times of tragedy, supporting financial needs so the family can focus on healing. And we provide events so families can come together to celebrate as a community, building bonds and strengthening camaraderie. Through our work, these families know where to turn if there is a need, and we want them to understand that it is the sole reason we exist – to support them. What are the most important and beneficial programs that the Foundation has provided? Our programs work together to provide protective factors to the Naval Special Warfare community. We work to ensure strength and resiliency for those men, women, and families that have been at war for more than 16 years by providing a cornerstone of support. The area where we have the most immediate and obvious impact is with our Gold Star and Surviving Family programs. The immediate and ongoing support we provide to the families that lose a service member in combat, training, or the line of duty is unmatched. Our support is instantaneous and far-reaching. We are a big part of letting these families know that Naval Special Warfare is still and will remain their family. We wrap our support around them, not just in the days immediately following the loss, but for years to come. We create a community of family members that lean on each other for support, and we provide them opportunities and tools to connect and heal. Watching the children grow and knowing that we play a part in providing them with the tools they need to become successful, strong adults is sometimes overwhelming. They have sacrificed so much, and we are honored to work alongside them. Can you recall a particular moment when you felt you had made a positive impact on a particular veteran’s life? A moment that showed you just how much you were helping people? Of course, your work is incredibly important to the people you serve, so you might feel this way all the time…. I’ve often told donors that I wish they could spend a few days with our team so they could hear firsthand the impact we are having on the people we help. We are thanked so often and so deeply that we feel humbled to be receiving the praise. I can think of many instances of our support having a significant impact, but I feel the work with and for our Naval Special Warfare kids carries the most weight. Recently, at a Change of Command ceremony, we had a SEAL Spouse run across to thank us for everything our camp had done for her son. She was teary-eyed and so very proud to tell us of the transformation she saw in him after just a week away at our Foundation camp. He had grown by facing challenges at camp. She now saw strength in him that she knew had always been there but that our camp helped him realize. Are there any initiatives that you are responsible for that you are particularly proud of? In 2016, the Navy SEAL Foundation held its first Whole Warrior Health Forum. We wanted to bring together experts in brain health and PTSD to help identify the best pathway to care for our military community members. We hosted prominent speakers like Dr. Benjamin Omalu and Sebastian Junger, who pushed the boundaries of common thought on brain injury and reintegration of veterans into society. Hundreds of people came together to share and learn about brain health, and the results have had a direct impact on Naval Special Warfare. In 2017, we held our second event, where we focused on the issues of chronic pain, sleep optimization, suicide and PTSD. Through this effort, the Navy SEAL Foundation has significantly moved the needle on how Special Forces address these issues while sharing valuable information with the community, public, judiciary system, first responders, and more. We are so proud to provide this conference at no cost to attendees for the sole purpose of information sharing. The connections made have been far-reaching, and we will continue to bring experts together in the future. Something I find very interesting is that a vast majority of the Foundation’s executives are women, while at the same time there has yet to be a woman enlisted as a Navy SEAL. Regardless, it seems very powerful that women have such a loud voice within this organization. Do you think that your organization gives empowerment to women, and if so, how? Staffing at the Foundation has not purposely leaned toward women, but in the past, many of the roles attracted women candidates. We have an impressive team whose members could be doing almost any job they wanted, and I feel so lucky to have them. Today, with the success of the Navy SEAL Foundation and the expansion of program support, we are seeing more interest from men, but frankly, the people who continually reach out to tell me about their interest in working for the Foundation are women. I’d like to think we empower every person who works for us, and that we are providing valuable experiences and challenges for their careers. We seek out the best candidates for the jobs; we don’t look for a man or woman in any role. If the women keep showing interest and drive, then they will be the people who get the job. My mission is...for the Foundation to provide immediate and ongoing support to the Naval Special Warfare community and its families. My mission in my work at the Navy SEAL Foundation is to provide leadership in the military benevolent space and offer security and strength to our Naval Special Warfare families. There are so many organizations working to support the military, but there is a lot of duplicative effort and confusion. By bringing organizations and groups together to define our missions, visions, and tactics, we will help declutter this space and ultimately serve those we support more efficiently. Our goal as leaders in benevolence should be to solve the problems, not to compete. For our families, I want the Navy SEAL Foundation to be the door that people knock on first. We want to be the overarching support organization—the connector to the best support available. We want to make seeking and receiving support easier and less burdensome on Naval Special Warfare, and we want to streamline access. Working with other organizations, we can help ensure the SEAL community and the military community at large receive the support they deserve.